Je vous propose le dernier détail des personnages de ma toile sur Manon des sources peinte en 2014. All the rocky part was made entirely with a knife, the rest with a brush. You will discover on this painting the source "Manon". From this story a legend was born. The day when Manon discovered the source that had caused her father's death, she returned in a monstrous wrath. To immortalize this story she carved and painted day and night even the rock. She took C brushes to reproduce her father with her donkey Jean Cadoret called "Jean de Florette". On each side of the cave the two protagonists who caused the death of his father Ugolin Soubeyran called "Galinette" and Caesar Soubeyran called "The Papet" she did the same, but from the light of a lantern, the flame of the oscillating candle with the drafts of the cave and the humidity made it more difficult task, the paint having difficulty drying. His face (that of Manon) which watches the entrance of the spring and casts a spell to the one who tried to clog it by changing it into water was the longest since carved in the rock. At certain times of the day if you pass by there you may be able to see in the streams of water, the water take human shape, and if you still have your child soul and a pure heart to your surprise this the human form will come to life under your eyes. Ouf, j'ai l'âge ! Tant mieux car elle est magnifique cette Manon ! Bravo ! Avec plaisir ! C17=Noël ! Les bonnes courbes au bon endroit, impeccable ! je prendrais bien une douche avec elle ! Love how the sunlight is hitting her body. Beautiful work! thank you very much OleKobe Manon My 84 th linen canvas from 120x60 on 07-2014 Step by step on Youtube https://www.youtube.com/watch?v=QOch-uA-EYo&index=55&list=PL_UtMgCHsx86iuOoT268EebbZT4BbgIOo All the rocky part was made entirely with a knife, the rest with a brush. 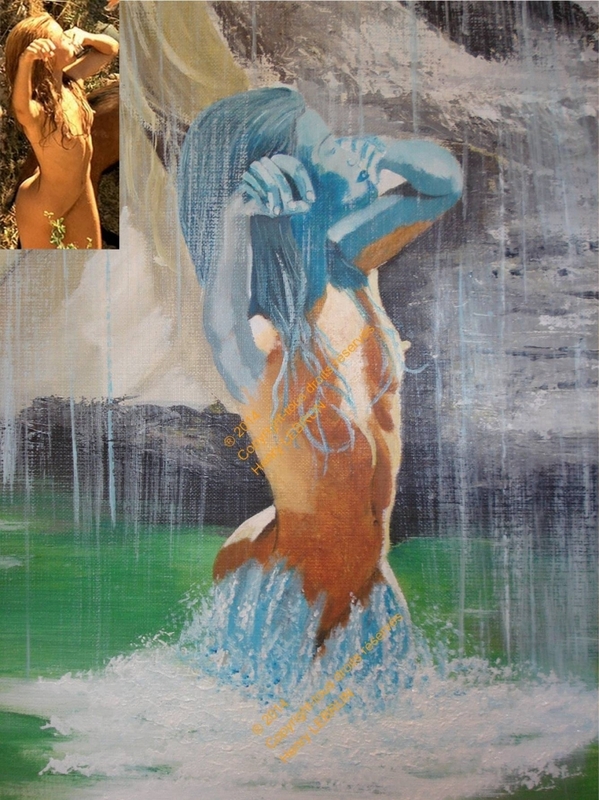 You will discover on this painting the source "Manon". From this story a legend was born. The day when Manon discovered the source that had caused her father's death, she returned in a monstrous wrath. To immortalize this story she carved and painted day and night even the rock. She took C brushes to reproduce her father with her donkey Jean Cadoret called "Jean de Florette". On each side of the cave the two protagonists who caused the death of his father Ugolin Soubeyran called "Galinette" and Caesar Soubeyran called "The Papet" she did the same, but from the light of a lantern, the flame of the oscillating candle with the drafts of the cave and the humidity made it more difficult task, the paint having difficulty drying. His face (that of Manon) which watches the entrance of the spring and casts a spell to the one who tried to clog it by changing it into water was the longest since carved in the rock. At certain times of the day if you pass by there you may be able to see in the streams of water, the water take human shape, and if you still have your child soul and a pure heart to your surprise this the human form will come to life under your eyes. It's good to see how you build up the colors in layers. Very instructive. thank you very much Manon My 84 th linen canvas from 120x60 on 07-2014 Step by step on Youtube https://www.youtube.com/watch?v=QOch-uA-EYo&index=55&list=PL_UtMgCHsx86iuOoT268EebbZT4BbgIOo All the rocky part was made entirely with a knife, the rest with a brush. You will discover on this painting the source "Manon". From this story a legend was born. The day when Manon discovered the source that had caused her father's death, she returned in a monstrous wrath. To immortalize this story she carved and painted day and night even the rock. She took C brushes to reproduce her father with her donkey Jean Cadoret called "Jean de Florette". On each side of the cave the two protagonists who caused the death of his father Ugolin Soubeyran called "Galinette" and Caesar Soubeyran called "The Papet" she did the same, but from the light of a lantern, the flame of the oscillating candle with the drafts of the cave and the humidity made it more difficult task, the paint having difficulty drying. His face (that of Manon) which watches the entrance of the spring and casts a spell to the one who tried to clog it by changing it into water was the longest since carved in the rock. At certain times of the day if you pass by there you may be able to see in the streams of water, the water take human shape, and if you still have your child soul and a pure heart to your surprise this the human form will come to life under your eyes.